Besides Lumens-where buyers may found support at $0.43, most alt coins are on a slide. 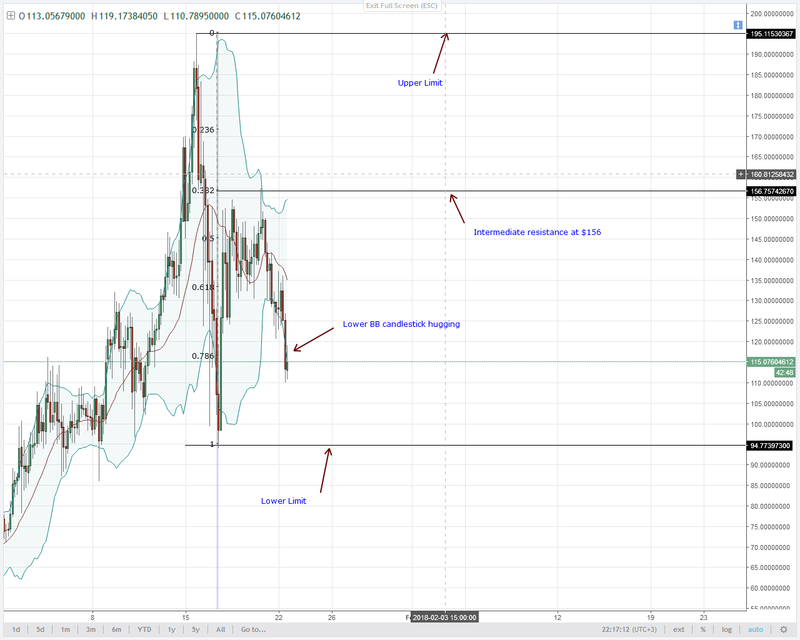 EOS is our focus today and while at it, the significance of $12 should be brought to your attention. If you check the weekly chart, there was an over-valuation after last week’s close and this week might be full of correction especially if bears drive prices below the middle BB in the 4HR chart. 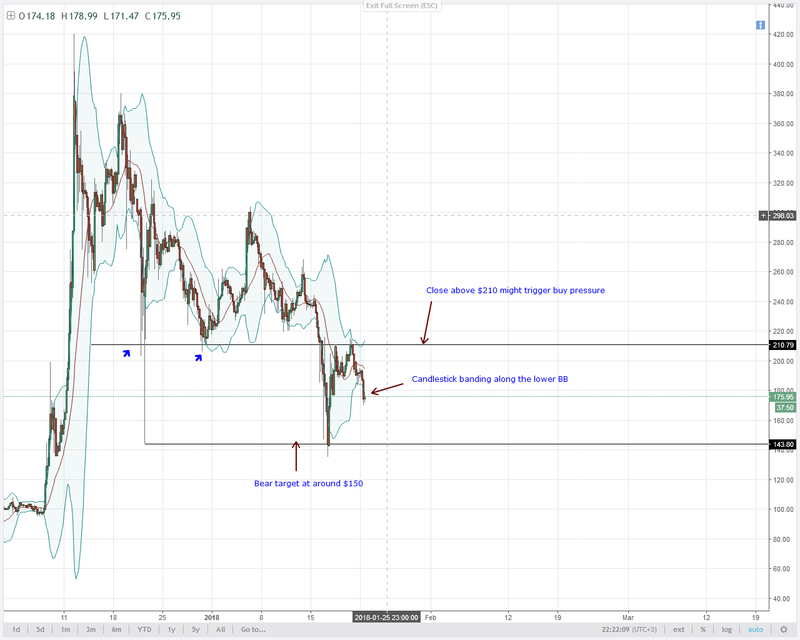 In comparison, LTC, NEM and NEO are bearish and we should be actively looking for sell set ups in lower time frames. The bearish engulfing candlestick on January 2016 was met with a double bar reversal pattern on January 17. What we saw next was series of higher highs back to the main resistance line at $1.14. In the daily chart, January 16 candlestick broke below support signaling bear pressure and the same bearish set up is visible in the weekly chart. This confluence of sell signals in all time frames is the reason why we should be looking to short now that we have that minor break out below the support trend line on our entry chart. Look at that blast!! The more NEM sellers unload their position, the higher the chances of lower BB banding and the faster our bear targets at $0.50 would be hit. The significance of $0.43 in the 4HR is clear. From first glance, can the current price action trending as the last leg of an inverted head and shoulders formation? 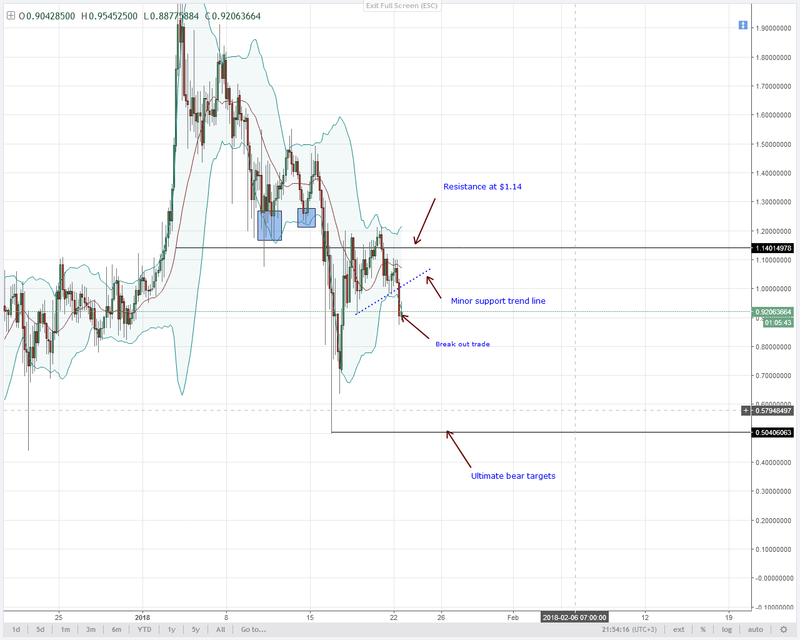 The head bottoms and support is at $0.30 and that is where bulls entered the trade pushing prices higher while the neck line is at $0.43 from where XLM buyers are finding support. If indeed it is, then prices could appreciate and the minor resistance trend line shall be a perfect selling zone. 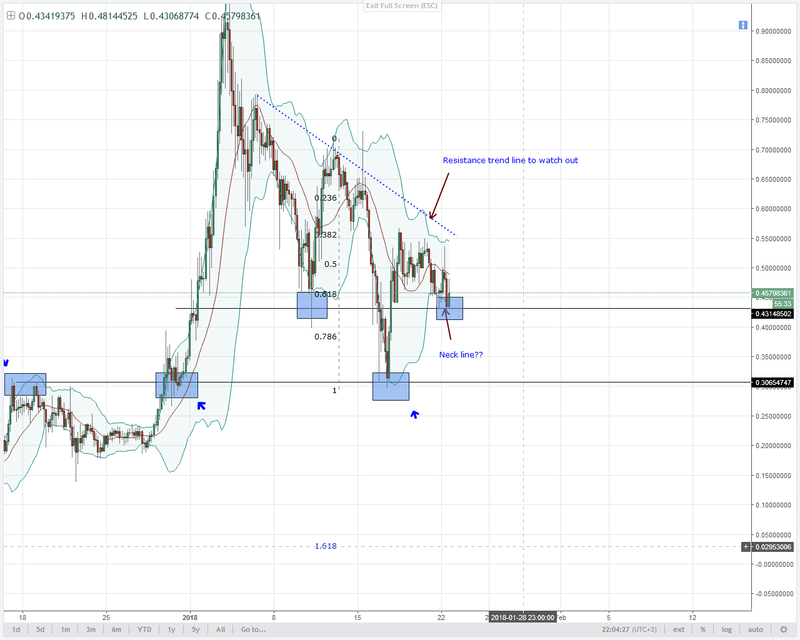 Pasting a Fibonacci tool between last week’s high low put potential reversal zones at around $0.55 and $0.63. On January 22, NEO depreciation was spectacular and went against our forecast. Our potential sell zone was at around $155 and $180 but look at these sweet lower lows in line with last week’s bear trend. It’s disruptive but now, here’s our plan. When we paste a Fibonacci retracement tool between last week’s high lows, our intermediate resistance is above January 20 highs at $155 and that is where the 38.2% Fibonacci resistance level lies. However, because of the lower BB candlestick hugging and strong bear momentum, we should look at initiating sell positions with first bear targets at $94. Sellers are in charge and besides the change in LTC price, bear candlestick are now hugging the lower BB meaning sell momentum is strong. Otherwise, our forecast remains constant. This is the first time in 3 days when EOS sellers are testing the middle BB. 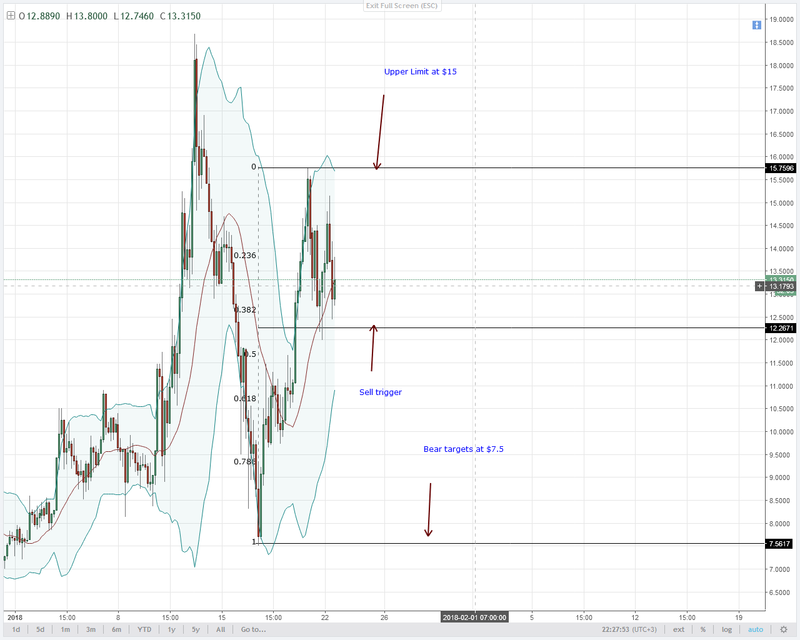 Check out the shift of momentum and retest of the middle BB within the last 24 hours. In my view, $12 will be an important support zone and should prices close below it today, then don’t hesitate to short and ride bears as they aim at $7.